Visage's momentum continues, as we've gone live this year with historic implementations of the Visage 7 Enterprise Imaging Platform at some of the world's largest, most prestigious institutions. Join us as Visage will be demonstrating "Proven. 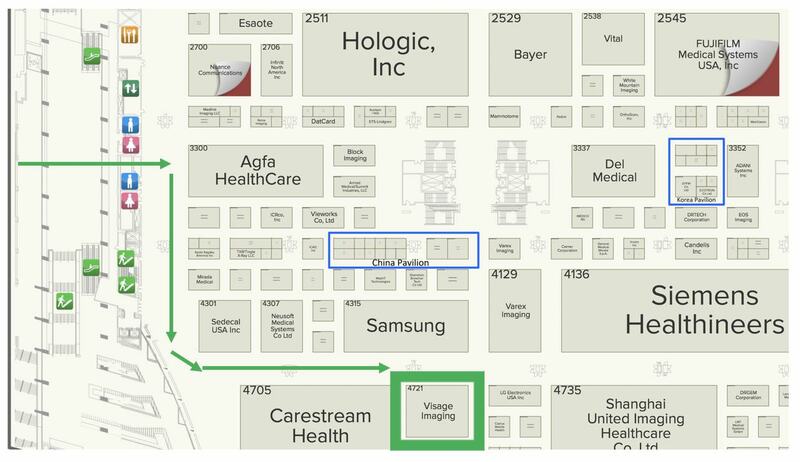 Enterprise Imaging" at the Radiological Society of North America (RSNA) 2018, Booth #4721 in Chicago, IL, November 25- 29, 2018! For more information, please read our RSNA 2018 press release. Checkout the proven and acclaimed Visage 7, including the exciting Visage 7 Open Archive, to experience the fastest, most reliable solutions in Enterprise Imaging. At RSNA, we'll also be demonstrating Visage 7's latest developments supporting multi-modality imaging, as well as other clinical image data, whether for ophthalmology, OR documentation, or other photographic use cases. Additionally, we'll be demonstrating Visage 7's ideal artificial intelligence (AI) concept to bridge both diagnostic imaging and data science research through the use of the same enterprise imaging platform. Experience our continuing works-in-progress efforts in AI, with self-developed, customer developed and third-party algorithms integrated to Visage 7 via our open API for AI. Please enter your contact information to the right, complete with any special requests, and we'll work to schedule you a priority demonstration. Don't delay, as the schedule fills quickly.